Located in the heart of the City of Sonora, the Dragoon Gulch Trail provides its visitors with a unique opportunity to stroll through the Mother Lode’s oak woodlands. 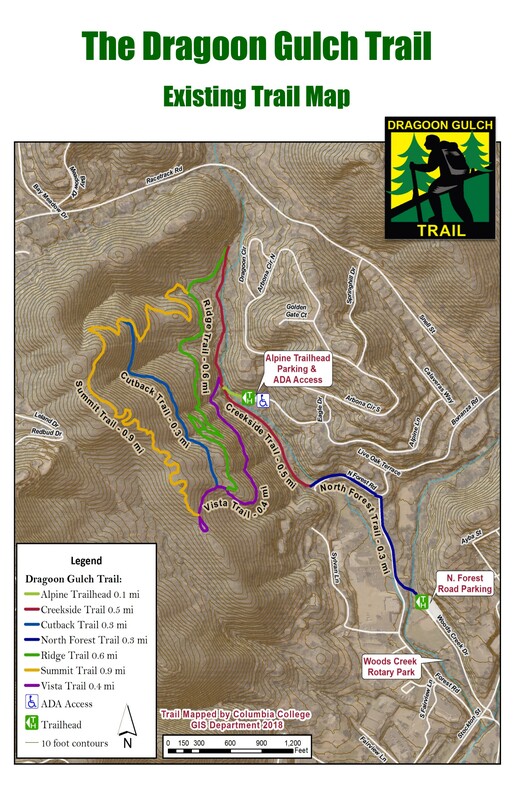 The Dragoon Gulch Trail provides over 3.1 miles of natural trails. The trails travel along a seasonal creek to vistas that provide spectacular views of the City and its surrounding mountain ranges. The trails vary in difficulty making it perfect for the casual walker and for those who want a strenuous hike, jog or bike ride. The City of Sonora hopes you enjoy your visit to the Dragoon Gulch Trail. The city does not take responsiblility for personal injury or losses while visitng the Trail. The Woods Creek Trailhead, is located at Woods Creek Park. From Highway 49 heading north into the City of Sonora turn left on Woods Creek Drive (across from the Mother Lode Fairgrounds) and follow the signs to the trail. If traveling south on Highway 49 (Stockton Street) turn right on Woods Creek Drive. Parking is available at the trail entrance. Public restrooms are available at Woods Creek Park. The Alpine Trailhead, ADA trail access, is located off of Alpine Lane north on Highway 49 through Historic Downtown Sonora, at the Historic Red Church, turn left onto Snell St. If traveling south on Highway 49, north of Historic Downtown Sonora, turn right on School St. and then turn right on Snell St. Once on Snell St., continue through the first intersection. At the next street turn right onto Calaveras St. and then left onto Alpine Lane. Stay on Alpine Lane and at the first intersection (about 1/8 mile) keep to the left. The trail entrance and parking lot is accessed at the end of the street. Remember that this gate is locked at dark. BACKGROUND: The Dragoon Gulch Trail Project officially began in 2002 with the City’s receipt of a $500,000 Roberti-Z’Berg-Harris Nonurbanized Area Grant (RZH). The 35 acre site had been slated for residential development but owner, Dr. Audrey Glover, was in support of the City’s efforts and sold the property to the City at a reduced rate. The remaining grant funds were used to develop the initial 2.5 mile looped trail. The Stanislaus National Forest’s Trail Crew and Baseline Conservation Camp assisted the City with trail development. On June 3, 2013 the City Council approved the Dragoon Gulch Mater Trail Plan. The Plan details the expansion of the trail system, and other recreational facilities, within the adjust 67 acres. It was funded under the Community Transformation Grant Program through the Tuolumne County Public Health Department. 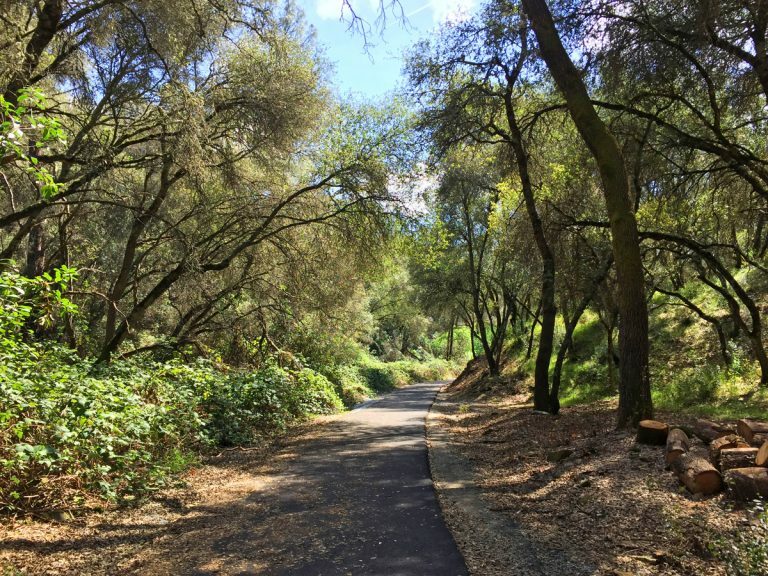 Environmental review, funded through the Tuolumne County Transportation Council, of the Dragoon Gulch Trail Expansion Project was completed in 2016 allowing the City to move forward with the Trail expansion. The Dragoon Gulch Trail Expansion Project – Phase 1 was completed in 2018. The project added an additional 1.5 miles of trails. It was funded through grants from the Sonora Area Foundation and Front Porch and Trail Me About Fund and processes form the Annual Dragoon Gulch Run. The development of the Dragoon Gulch Trail was accomplished with the assistance of many individuals and agencies, without who, this project would not have become a reality.